"By my opinion, CADprofi is very important for us because it helps to sell GstarCAD licenses much easier. GstarCAD user is getting with CADprofi more sophisticated CAD solution, than with pure GstarCAD only." "Our drafting time is shorten as never been before. Help us much save time and accuracy. We would like to thank you to CADprofi software and local partner brought the better thing to us." "CADprofi software is very important for GstarCAD sales because it provides vertical solutions for specific customer needs. A good opportunity is to create combined bundle offer." "We are very pleased with the cooperation of our program with CADprofi. Thanks to CADprofi, GstarCAD users gain a lot of useful features that allow them to increase the speed and effectiveness of their work." "We are happy to say that CADprofi has proved to be a very popular Add On for our customers." "CADprofi applications together with ZWCAD are the perfect bundle." "We find CADprofi Add-ons very useful, since they are highly professional and integrate with ZWCAD software extremely well. As such they are very well accepted among our users as well." "CADprofi is a good ally of ZWCAD, and the combination of both allows our clients to reach maximum productivity." "CADprofi efficient helps in successful distribution." CADprofi company received the "Elektrolaur Mazowsza" award in the global market sales category. The award was granted by the Warsaw branch of the Association of Polish Electrical Engineers. Development on the global market is an important element for us. Thanks to this CADprofi program is used in 24 languages in over 100 countries by over 126 thousand users. We currently have two main offices (Poland, Germany), four representative offices (Italy, Russia, Thailand, Japan) and a distribution network - over 100 trading partners that sell our program worldwide, thanks to this you can have direct support in your own native language. Over 3100 users and 29 IT specialists recruited by the Market Research Institute Statista rated software suppliers for companies. Best software suppliers were selected based on user trust, efficiency, reliability, security, further development, market penetration and expert evaluation. CADprofi program received the title "Trusted Solutions 2018" in the CAD Software category. In the "Do you recommend to others" category, we received the highest "very good" rating! We would like to take this opportunity to thank our customers because only thanks to your trust we could receive this award. Such a good opinion about CADprofi motivates us for the future, so that our solution would be even better and more user-friendly. During the GstarCAD Global Partner Symposium 2018, CADprofi received the "Development Partner of the Year 2017" award. We would like to thank Gstarsoft, producer of GstarCAD for this distinction. We have been cooperating with Gstarsoft since 2008, ensuring maximum CADprofi compatibility with new versions of GstarCAD. We believe that the CADprofi and GstarCAD software is a perfect combination that combines speed and performance with convenience of use. We would like to take this opportunity to thank our customers and distributors. We are grateful for the trust that has been shown to us, which has enabled us to achieve success. CADprofi company has received the CAD Expert certificate in the field of software that helps in designing of evacuation plans and fire protection installations. As an expert, we participate in fire safety congresses, during which we conduct lectures on the design of fire protection installations. 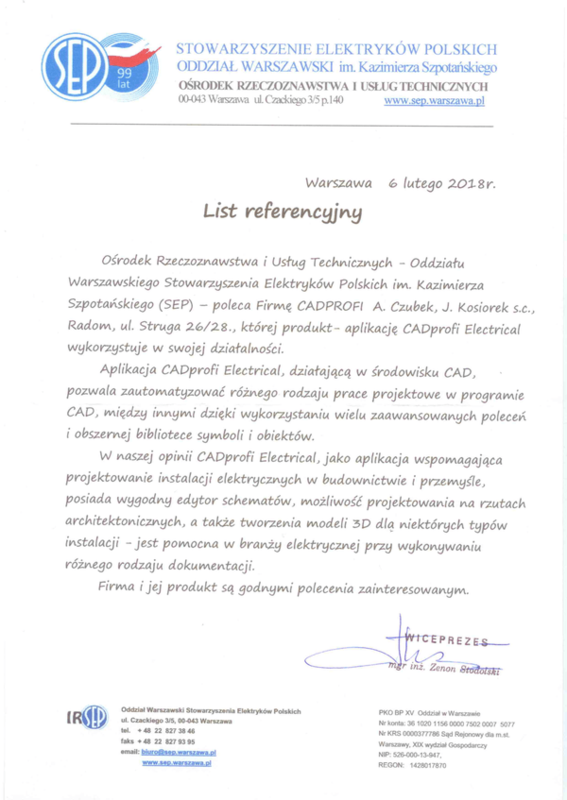 Center for Appraisal and Technical Services - Warsaw Branch of the Association of Polish Electrical Engineers recommends the CADprofi Electrical program. According to SEP, the CADprofi Electrical program allows user to automate various types of design work in the CAD program by using many advanced commands and an extensive library of symbols and objects. Both the company and the product are worth recommending.